Photo source: Copyright © GoWestAfrica. Used with permission. The Bambara are a large Mande ethnic group located mostly in the country of Mali. They are the largest and most dominant people group in that nation. Across the border in Mauritania, there are a small number of Bambara living near the town of Timbedra. The Bambara have long influenced the areas in which they live. During the eighteenth century, two Bambara kingdoms existed in West Africa: the kingdom of Segu and the kingdom of Kaarta. However, in the mid-1800s, Muslim rivals overthrew their rule. For many years, the warlords resisted Muslim occupation. Then, early in the twentieth century, the French gained control, bringing an increase in trade. Many Bambara converted to Islam as they were exposed to Muslim trading groups. Because Fulani, Soninke, and Malinke cities and lands were absorbed into the Bambara kingdoms, their cultural influences remained part of the Bambara lifestyle. They speak Bamana, a Niger-Congo language. The Bambara are mostly farmers with a unique cooperative system of agriculture. As a single unit, an entire community plows, plants, weeds, and harvests. Together they cultivate their principal crops of millet, rice, sorghum, and fonio. Many Bambara also keep small animals such as goats and chickens. Within the community, men are responsible for hunting, fishing, tending to the animals, conducting foreign trade, clearing land, and doing most of the farm work. Women's duties include gathering forest products, caring for the chickens, cultivating garden plots, and trading in local markets. Their diet consists mainly of meat, rice, groundnuts, mangoes, and yams. From the forests and bush, they gather wild seeds, fruits, kola nuts, shea nuts, and palm oil. Crafts, such as dyeing, woodworking, and leather-working, remain a part of Bambara life. 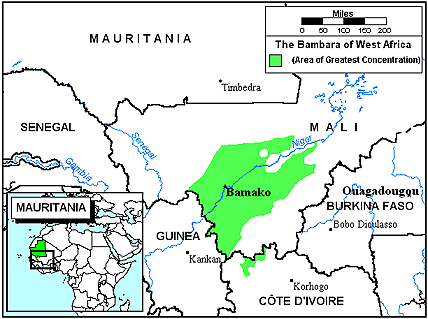 The Bambara live in compact, permanent villages or towns. Their houses are rectangular with flat terraced roofs made of beaten earth. Each has an interior courtyard and an external wall of sun-dried brick. A number of these homes compose a village or town, which is normally divided into wards or quarters. In the center of almost every village is a baobab tree where the elders sit to judge disputes and make decisions. The chief of each village is called "Master of the Land." He plays a "supernatural role" as communicator between the land and the spirits of the ancestors who first settled it. Polygyny (having more than one wife) is often practiced among the Bambara. The first wife enjoys a superior status and dominates the other wives. Each wife has her own house where she raises her children. Education is valued, and children are encouraged to attend school so that they might receive a "Western" education. Although most Bambara live in rural areas, some have flourished under the modernization brought by the French. These Bambara have moved into the major cities where they have become influential in commercial and transport industries. Though less than a third of the Bambara practice their traditional religion, many aspects of it coexist with Islam. They believe in a supreme creator god as well as in gods of the air and water. Ancestor worship is central to their ethnic religion. Ancestors are thought to take the form of animals or even vegetables! Special rites are performed to worship them. The eldest male of a lineage serves as mediator between the living and the dead. Because of his age, he is considered nearest to the world of the departed. The dead are believed to be appeased with offerings of millet flour and water. The drought in the 1980s caused many problems for the Bambara, resulting in a severe shortage of food and great loss of livestock. Also, the literacy rate is low. Christian educators may be one way to minister to them. The spiritual needs of the Bambara are even greater than their physical needs. Various resources are available, but the number of believers is small. Urgent prayer is needed to reach the Bambara with the Gospel of Christ. * Ask the Lord of the harvest to call Christian doctors and teachers to work among the Bambara of Mauritania. * Ask the Holy Spirit to anoint the efforts of missions agencies focusing on the Bambara. * Pray for effectiveness of the Jesus film among the Bambara, with many conversions resulting. * Ask God to open the spiritual ears of the Bambara as they listen to Christian radio broadcasts. * Pray that God will use the Bambara believers to share Christ with their own people. * Ask God to raise a mighty army of intercessors to stand in the gap for the Bambara. * Ask the Lord to bring forth a strong Bambara Church for the glory of His name! View Bambara in all countries.